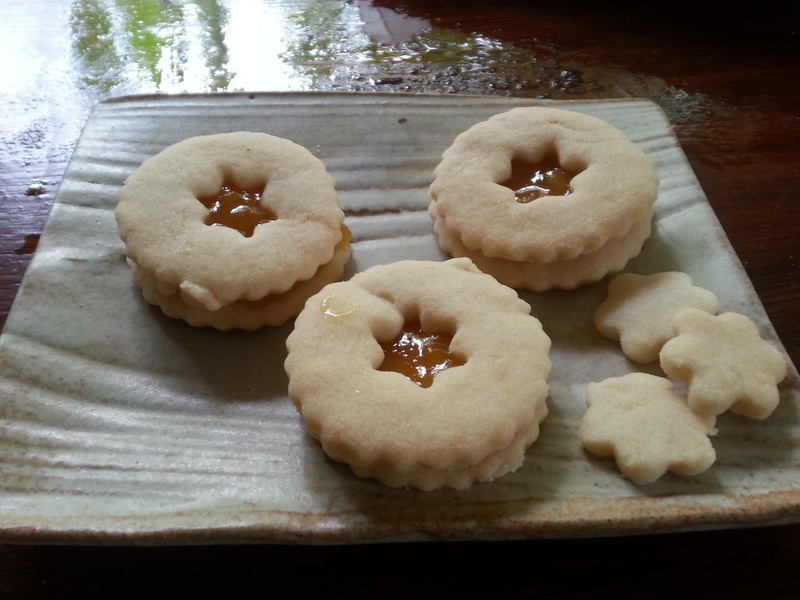 Last week’s market special: shortbread cookies with mango ginger jam. Here’s a little rant – feel free to skip to the next paragraph if you’re likely to be offended by a little feminism. So, as a woman, in a world of farming and construction, one is constantly faced with men assuming that one has no idea what one is doing or talking about. Now, I’m not saying every man is this way, for I know and have known many who are extremely supportive and respectful, giving as much space as is needed, lending a hand or giving advice only when it is asked for. To the latter, I thank you, for you are rare and precious beings. To the former, enough! If I need help in the hardware store, I’ll goddamn ask for it! If I’m in a corner minding my own business, getting what I need to get, stay away! If you ask if I need help (I get it, you are required to ask everyone if they need help, it’s your job), and I say “no thanks”, then go find someone else who really does need help (who knows, they might not be female, young, and pretty, but that’s too bad)! Do not stand there badgering me and trying to tell me how to do something when -guess what- I didn’t ask for your advice. Last week it was a guy trying to tell me how to measure out screws. Well guess what, old man? I am standing there slowly adding screws to a bag (a small bag, because I don’t need many) because while I add screws a few at a time I’m mentally calculating how many I need for each of the 15 projects I need them for. Trust me, I could fill the bag up quicker than you…or that bigger bag that you’re showing me too…if only I actually needed that many! Did I ask you how to put screws in a bag? No? Then why are you trying to tell me? 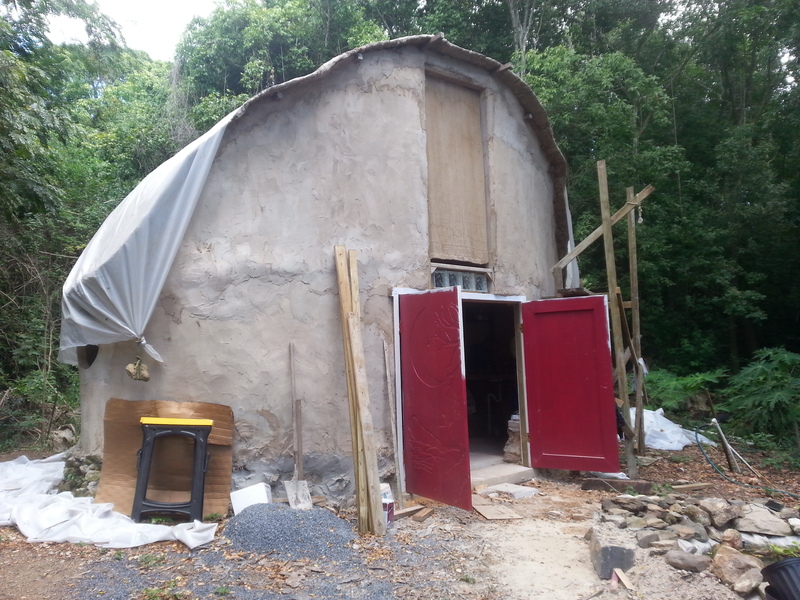 I just built a house – what have you done in the last year? Annoyed a few hundred women who knew what they damn wanted and were just trying to mind their own business? Over and over and over this kind of thing happens, and it’s so tiresome. So, guys who work in hardware stores…next time a man and a woman walk into the store…ask the man if he needs help first. Because let me tell you, he is the one who will refuse to ask for help if he needs it. I may be prettier, but you’re here to serve customers, not to flirt. While I’m on the topic, if I’m at work and come out to load something into your vehicle, 99.99% of the time I’m doing it because it’s my job to do so, not because I wish to flirt with you. That’s a 1 in 1000 chance that I’m wishing to flirt with you, ok? The odds aren’t good. 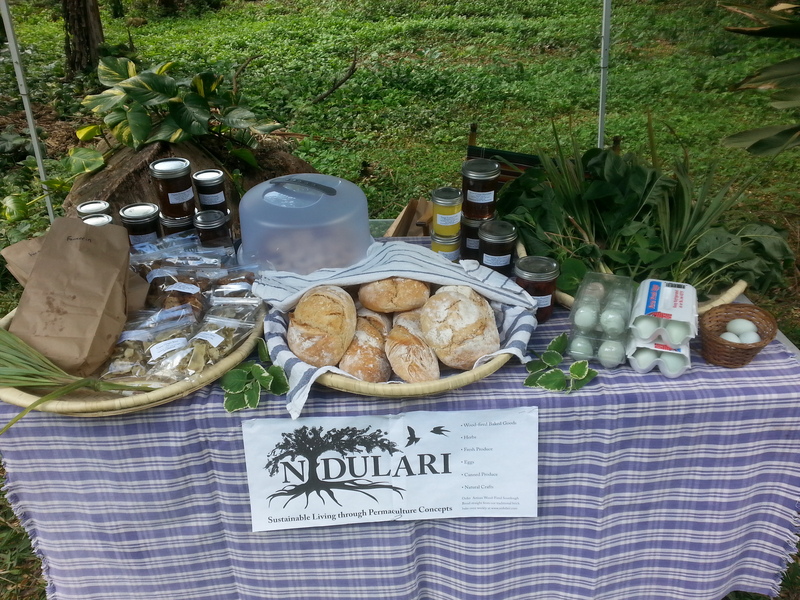 Toasties, shortbread cookies, and lemon curd, all available at our roadside stand, Wed 2:30-6:30pm. Thank you for bearing with me through that, and apologies for not posting anything last week! My computer charger suddenly went to heaven, leaving me technologically handicapped until a kind friend responded to my plea for a charger until one might arrive in the mail. Island problems, yet also great island friends who are there when we need them! 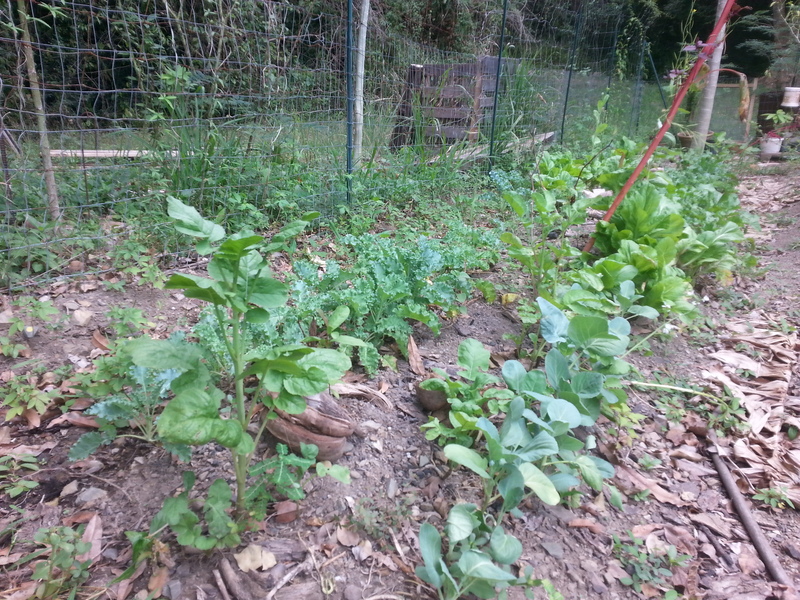 One of the more active rows in our original vegetable garden. 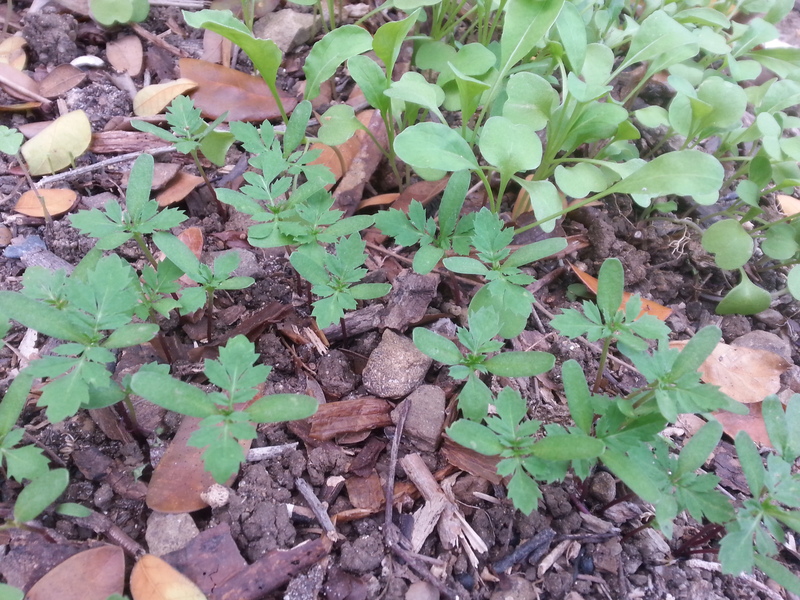 Arugula and marigolds (edible flower) seedlings in a mounded bed. Arugula (I think!! 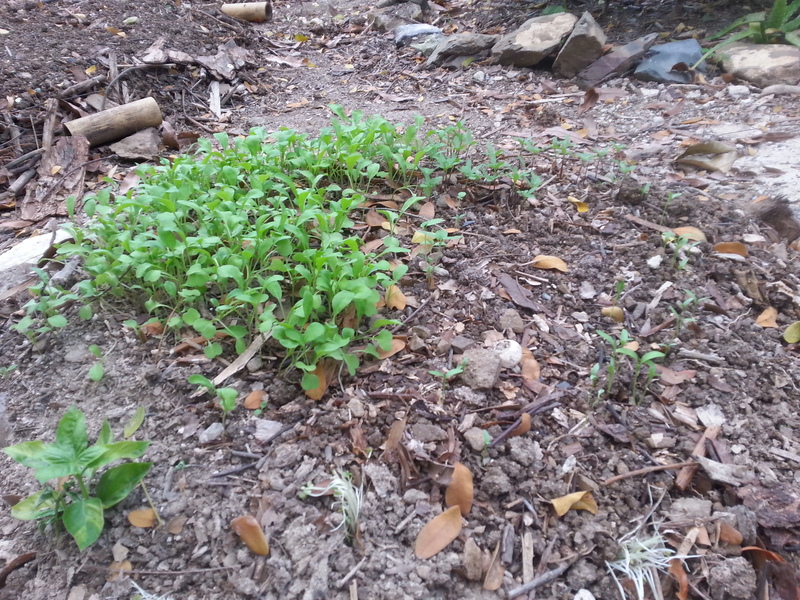 ), basil, tomatillo, and marigolds in another bed – all in the Nid’s front yard. 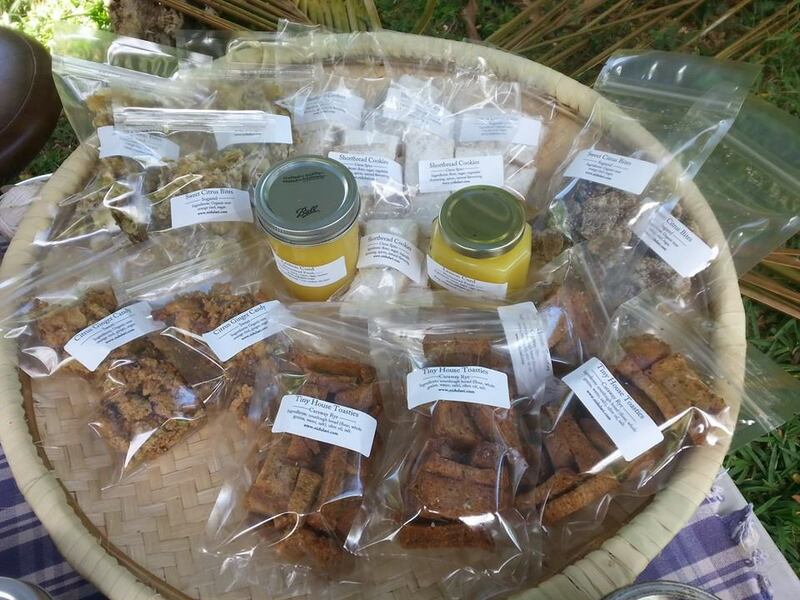 The last few weeks have been a whirlwind of activity, what with the coffee morning (a huge success, thank you to everyone who came out in support of Good Samaritan Foundation of Haiti! ), packing everything for the big sailing trip to Haiti, and then sending everyone off! Things are finally peaceful again, so I have resumed my digging, planting, dog training, and gathering of cooking inspiration. I finally got a chest freezer (thanks to my big brother – a very late Xmas present), so fresh fettuccine will soon be on the “specials” list now and then, along with other fresh-frozen goodies. We’re open for suggestions and requests for menu additions too! Mango season is of course coming up, so we’ll be premiering a few products featuring those delectable fruit along with our tried-and-true Mango Chutneys. 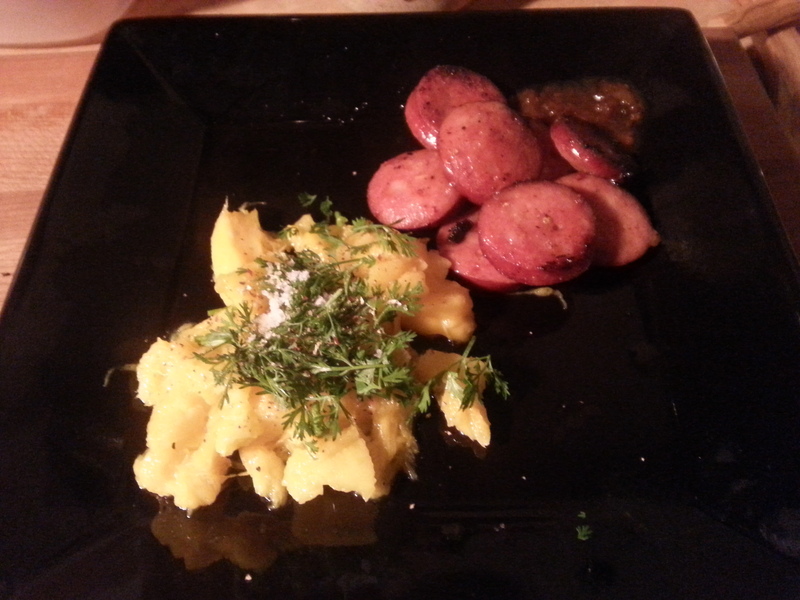 First mango of the season, made into a quick mango salsa to go with some sausage. An old sculpture of mine now growing watercress by the edge of the pond – re-purposing! 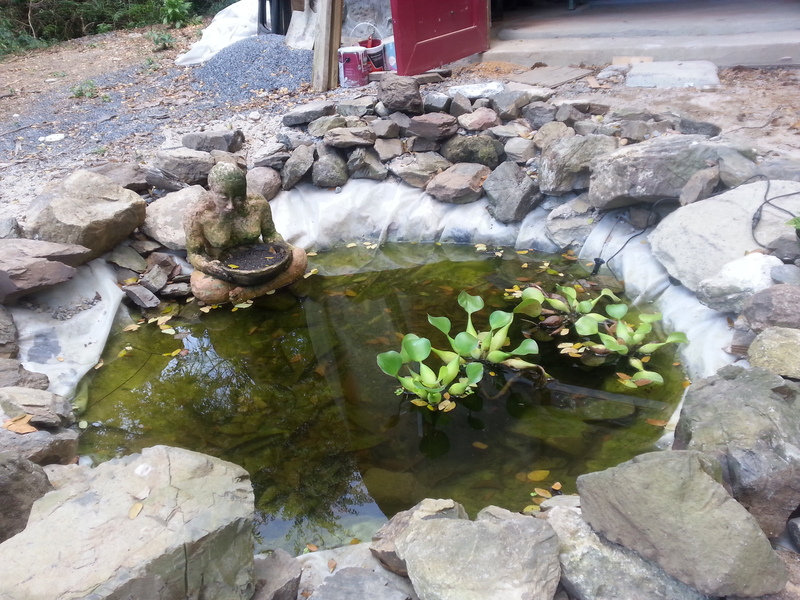 Water hyacinth and guppies cohabiting the pond – more aquatic plants welcome if you have extra! You may notice on our “Products” page that wholegrain sourdough has been replaced by an oat sourdough – we tried this out for the Coffee Morning and it was a huge hit, so it’s now on the menu for good. This is a yummy loaf with whole rolled oats in it, and is encrusted with freshly ground oatmeal. Give it a try this week – please have your orders in by 6pm on Tue. Open the doors….and see NO people! 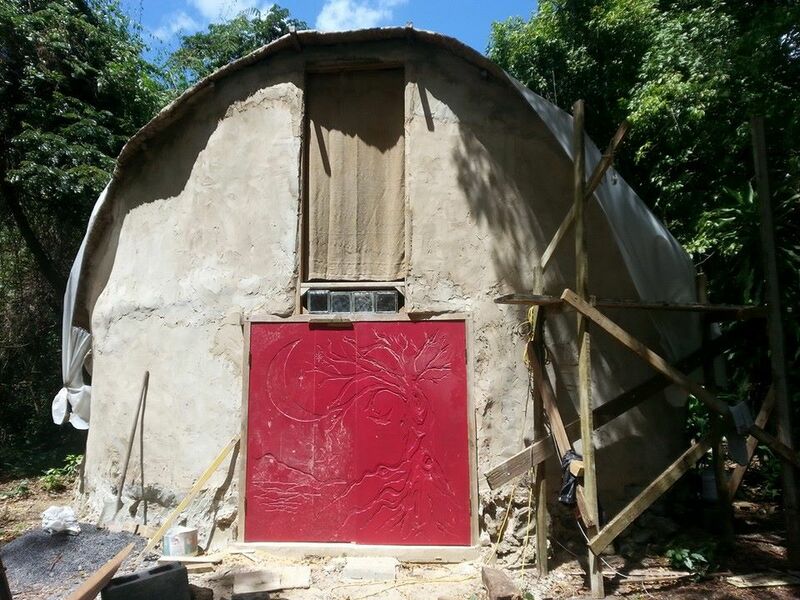 Did you see the Nid doors on our Facebook page? Well, they’re up, with some help from boat friends, Eric and Lynne – hanging doors is no easy task! Just have to plane some edges, touch up a little paint, and they’ll be all set. It’s amazing how much real doors change the atmosphere, for suddenly the Nid feels like a real house – even when the doors are open. They add a certain dimension to the building, plus a feeling of security that you just don’t get from curtains! Edwin is still getting used to staying indoors at night, but at least he’s not had any accidents thus far (puppy problems 101). 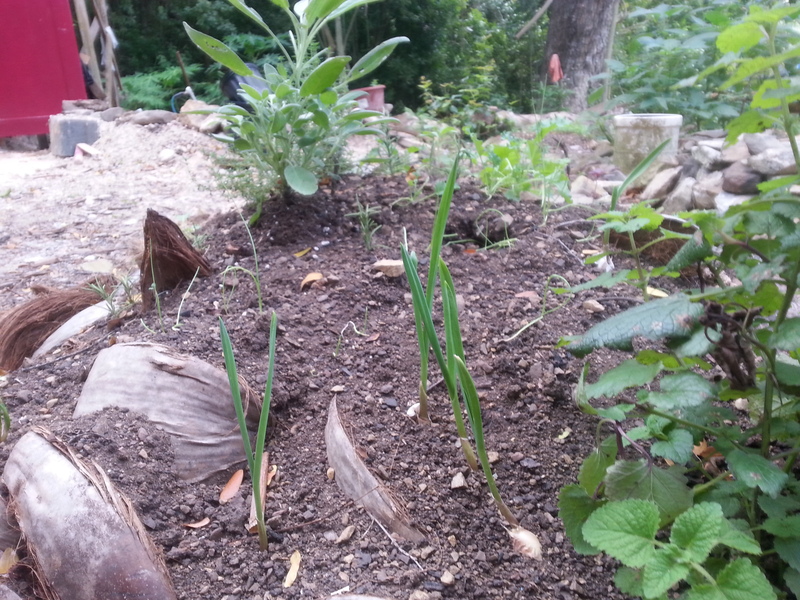 Garlic, sage, onions, thyme, “mint”, stevia, and cilantro all growing in a mound of coconut husk between a couple of large logs – experiments! One last thing before I peace out for the week: recycling! We live on a tiny island; where does all that trash go? The landfill fills….and fills…and fills….and still we have more trash. Do you compost? Reuse? Recycle? Well, I do! I know that composting can be tricky depending on where you live, so I’d like to help. Several people already collect up their kitchen scraps and compostables for our chickens and tortioses – you are very welcome to do the same. I can accept both veggie and meat/eggs scraps (eggshells too), along with shredded paper, cardboard (no tape/staples, please), wood shavings (non-treated only, please), leaves, grass trimmings from non-treated lawns, and garden weeds. The chickens eat what they fancy, the rest gets composted! Kitchen scraps can be fresh (up to a week old) or frozen, whatever is convenient for you, cardboard is best flat-packed. If you’d like to participate, just email me to arrange a drop-off time, or stop by on Wednesday during market hours. I’m also accepting egg cartons and plastic bags – any extra get distributed to other farmers who can use them. Mason jars are always welcome too, I give a 50c farmstand credit per jar. Currently I can use a case (24) of empty clear beer bottles (caribe or any other clear beer bottle with a removable label) if anyone happens to have – please email me! I look forward to working with you to reduce our landfill waste – don’t forget to bring your re-usable bag when you shop at the Farmstand on Wednesday afternoon!